So that's why Dark Herring was showing as I had it already when I did not. It should still work if you allow "outdated" addons in the addon settings. Refresh for icons on mail, bags, bank etc seems really super slow since the patch. 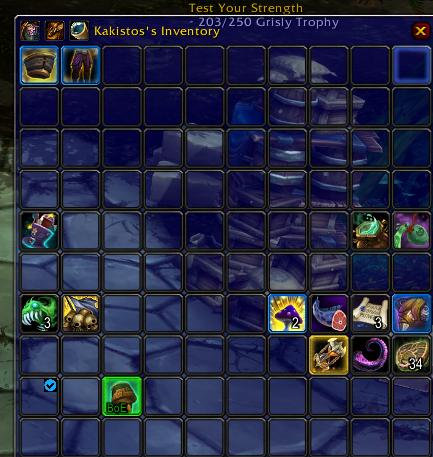 Did blizzard change/break something that's affecting how the addon works? Since the last update the little icons are stuck in the bag(bagnon). Only way to get rid of them is to reload the ui. Same. I reverted back to the previous one which works but now I have a 1 sec freeze when I loot BOEs from mobs with the bag open. Released bag and bank support in 8.0.0v1.13. Void Storage and Guild Bank will need separate support after Bagnon completely fixes them on their end. Appreciate the update, but unfortunately it's not working properly. I'll be rolling back to v1.11. Thanks Ludius, your PR works fine (except for void storage, which appears to just be completely broken in Bagnon). I'll make a new release with this version soon. Great to hear that you accepted my PR. :-) I just made another slight adjustment. Don't know if this is really necessary though (see my new PR's description). There hasn't been an update since Aug 29 about the icons not being removed on GitLab. Will the update be posted here for us to try as well? Latest version fixes the icons being left behind. If you're using Bagnon, a fix for that will be coming out soon. Ah, okay. I figured if an update came out, it'd fix the issue for all the addons it works with as well. Didn't realize there were specific things that had to be done for the other addons. Thank you for your work!